During the past few years it has become essential for companies to adjust their strate­gies when it comes to marketing and the ways in which marketing is established. This change in thinking has been considerably influenced not only by environmental factors, but also by changes in the needs and demands of different target groups, as well as changes in developing trends. Nowadays, these are exactly the challenges a great num­ber of companies are being forced to address. Moreover, in the last few years, it has become more and more apparent, that a consum­er’s psychology plays an important role when it comes to the acquisition of goods and services. In view of this finding it becomes vital for companies to strive to increase their chances of success by implementing communication strategies efficiently and effective­ly. As a result, nowadays is has become more common for companies to make use of research institutes in order to find out more about the needs of their customers, in other words, demand and supply. In doing so they attempt to combine marketing strategies with psychological aspects, especially with regard to communication policy. This ap­proach can help them to become more prominent and as a consequence, appear more attractive to the consumer, which in turn not only influences his way of thinking, but also his actions when deciding to purchase certain products or services. 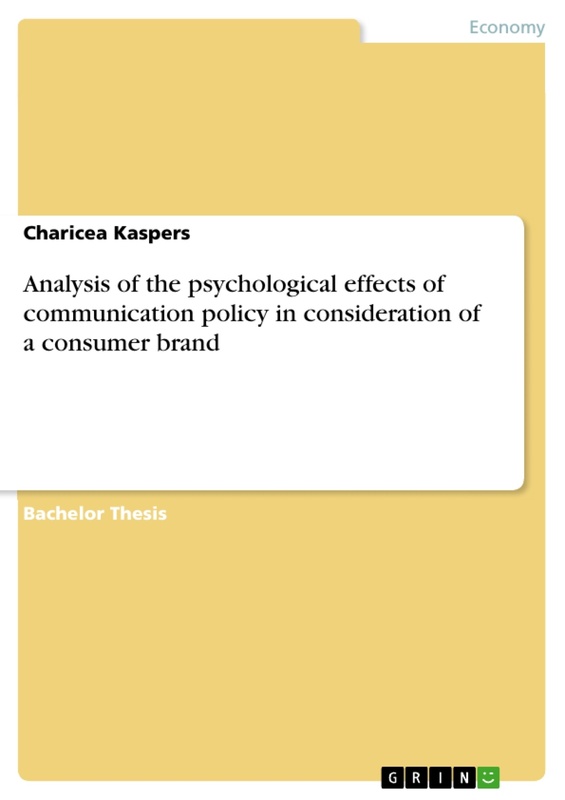 This thesis aims to expound the psychological impact that the communication policies of a company actually have on a customer’s buying decisions and the extent to which the purchasing behaviour of the consumer is influenced by such policies. 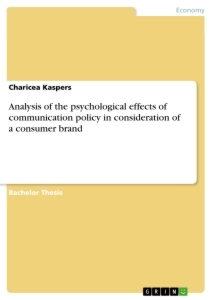 In the light of this, the thesis thereby primarily is intent on focussing on the correlation between psy­chology and communication policy while at the same time taking into account different factors, such as, what in detail does communication policy actually involve, does the processing of information have an impact on the buying decisions of customers and to what extent is this behaviour driven by external influencing factors. 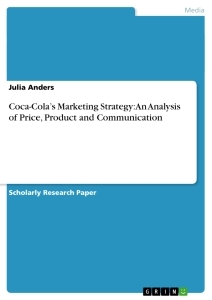 Moreover, the theory, which the thesis includes shall be reinforced by a market re­search, examining and establishing the extent to which advertising methods have an impact on the consumer, which in turn would most likely affect his buying behaviour. The structure of the thesis is as follows: The second chapter will specify and focus on marketing, broken down into its definition as well as the marketing mix which has a profound impact on this topic. Subsequently, chapter three will take a closer look at key psychological factors which have to be taken into consideration. Therefore, this chapter will focus on topics such as the activation and involvement of a consumer, the whole procedure involved in the pro­cessing of information including fundamental facts as to how the gathering of infor­mation functions and how the information is stored by human beings. The chapter will conclude with the learning curve because it is essential for companies to understand how the processes of learning factually take place, as well as the importance of consid­ering these factors and their possible influence. This section will include the most theo­retical part of the thesis, but together with chapter two, it will provide the basis for it. Chapter four will deal particularly with buying behaviours of a customer by categoriz­ing and explaining these different types. At the same time, it will take a closer look at external factors that also, to a greater or lesser degree, have an impact on the buying behaviour of a customer. In order to substantiate the theories found in chapters two, three and four the fifth chap­ter will incorporate a market research. This research will be based on the brand Milka and will reveal some insights which are essential in order to develop a deeper under­standing as to how, and if at all, communication policy influences the psychological and consequently in turn the buying behaviour of a consumer. The thesis will be rounded off with a conclusion, containing recommendations, as to how companies can improve their communication policies in order to reach and access the mind of the consumer using the most effective means in the best possible way. Another important tool for the successful market-orientation of a company is the so- called marketing mix. After a needs analysis has been made, a company has to decide upon the products and/or services they want to make available, as well as on an appropriate marketing strategy. It is of utmost importance for them to keep in mind that doing so is with the sole intention of either providing a solution to a problem, or in order to fill a current vacuum in the market. These points of consideration are vital for a company and deductive reasoning must be employed when desiring to operate successfully in the market. The reason being, that all points of the marketing mix are important to their customers because they are involved in influencing their way of thinking and consequently their purchasing choices. The aforementioned factors can be used either in combination, or individually, depending on the requirements or measures that evolve from each strategy. A scientific publication summarizes marketing mix as a target orientated strategy, an appropriate combination of the marketing mix tools utilized in tactical marketing. The four above-mentioned pa- rameters of the marketing mix strategy are the ones, on average, most commonly used. These respective points will now be discussed in greater detail. One important parameter of the marketing mix, among other things, is “place” also bet­ter known as distribution policy. It involves all matters of procurement as well as 10- gistic activities and is especially focused on ensuring that all services of a company are guaranteed to produce gratifying results for the consumer. The intent of this strategy is inevitably to provide customer satisfaction. In order to be capable of achieving this, it is vital that the company decides on the right distribution channels, such as online trade, wholesale trade, direct selling etc., as well as operating methods pertinent to, and lucra­tive for the company. Moreover, companies have to ensure that they employ persons who distinguish themselves as competent and reliable sales representatives, otherwise it becomes necessary for the company to invest additional time, resources and manpower in order to regulate the activities of those representatives who fail to comply with com­pany standards. Last but not least, the company has to carefully consider and evaluate which location would be strategically better suited to the aims of the company, what kinds of logistical systems would be needed, such as warehousing and their location, what type of packaging would be required, what kinds of transportation methods ought to be used (ship, train etc. ), in order to ensure that the products and services arrive at their final destination on time and in good condition. In summation therefore, it can be said that the parameter “place” contains all essential criteria involved in procurement and logistics. Another important parameter is “price”, also known as condition policy. This includes all activities aimed at establishing ideal terms which the consumer is prepared to accept. In other words, the supply and demand concept. On agreeing to such terms, it then be­comes possible for the customer to gain access to the full range of products and services provided by the company. Therefore, this instrument includes everything involved in the pricing of a product or service, such factors as discounts, allowances, terms of pay­ments, loans, terms of delivery, recommended retail prices etc.. Moreover, this parame­ter also entails the transaction costs, opportunity costs as well as physical costs. The main target of this instrument is to primarily strike a balance between keeping company costs to a minimum on the one hand, and on the other hand, to create a climate whereby the consumer feels a compulsion to acquire the products and services offered. The instrument “product” entails all activities which influence the range of products and services supplied by a company. Moreover, this policy directly has an impact on the benefits and advantages obtained by, and especially created for the customer. It can be said that this instrument includes all activities such as product design, quality, character­istics, assortment (which should include a wide variety of products in order to be able to make a clear distinction between a company’s products and that of major competitors), brands and customer services which also incorporates products etc.. As already indi­cated, “product” is a an important factor for the marketing mix, since a product mostly serves as an unmistakeably identifiable link to a company. 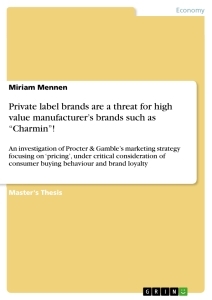 This finding is undeniably confirmed when considering company-owned brands, such as the example of Milka will show in chapter five. Due to the subject which was chosen for this thesis, consideration will now be given to “promotion”, also known as “communication policy”. The target of this policy is to gain or draw attention to the company’s services or products, to increase and manifest the level of awareness, as well as to create positive and pleasurable feelings about the com­pany and its range of available products or services. Sometimes communication policy just tries to convey specific information, but more often than not, and at the end of the day, it has to be admitted that any and all communication strategies utilized aim to trig­ger a buying impulse. A variety of these strategies are found in classical advertising. As a means to trigger buying impulses, a company will devise and employ methods, such as for example sales promotion, public relations, or direct marketing, involving the use the internet, phone calls, public relations, fairs, sponsoring, product placement, so­cial media and many more strategies all of which are conveniently customized to max­imize and achieve company goals. Using the communication policy, companies are in a position to make the consumer believe that by purchasing their specific product he is not only acquiring a status symbol, but that with such a purchase he is at the same time attaining a measure of prestige which is essentially connected with it. Furthermore, that this symbol or feeling of prestige is considered highly desirable to exclusive groups of people. But how can companies achieve this level of awareness? Why is promotion an effective way of manipulating the consumer’s mode of thinking and what does psychol­ogy have to do with this? Chapter three of this thesis will take a more precise look as to how a company can achieve these objectives. In order to comprehend why this chapter is essential for this thesis, it is vital to under­stand what the term “psychology” actually means, how it can be defined and what it encompasses. Nowadays, it is defined as a doctrine of people’s behaviour and its analy­sis, or as a scientific study of conduct and mental processes. Traditionally though, psychology seems to have had a variety of meanings over divergent periods of time. Various philosophers such as, for example, Socrates, Plato and Aristotle tried finding answers to questions, such as how the mind works and in what ways it is, or can be, influenced. There were also questions raised regarding the correlation between the con­duct of a person and his physical disposition, as well as whether the one aspect influ- enees the other. A scientific approach to psychology was recorded in the 19th century, when Mr. Wilhelm Wundt embarked on creating a psychological laboratory. With the help of the so-called “introspection” method he tried to establish a clearer pic­ture of processes that take place in the human mind. Throughout the years that fol­lowed, there were many different approaches on the part of various scientists, philoso­phers and other intellectuals who attempted to explain what psychology really is. Nev­ertheless, since the scope of this work is to understand how that brain processes infor- matron and how it is influenced by communication policies, the next chapter will espe- dally focus on how the brain assimilates information, how that data is processed, and what steps are involved. The basis of affective and cognitive information processing is activation and subsequent involvement. Activation means an arousal of the central nervous system in humans, which initially stimulates them to react in a certain way. By means of such a trigger, it becomes possible for a person to be supplied with the energy urgently needed to remain efficient at any given time. This fact can be proven by means of the Lambda- assumption, which shows the ratio between activation and performance, as shown in the graph below. The Lambda-hypothesis shows the relation between performance and activation, as well as the different stages involved and how the specific conditions affect the consumer. Every stage is categorized by psychological levels of arousal which are characterized by certain patterns of reaction. The Lambda-hypothesis can be divided into different theo­lies. These apply to the theory of minimal activation, normal activation, over activation and maximal activation. Within the minimum activation stage there is very little action expected. This is the case, for example, when a person is asleep. In contrast however, within the normal activation stage, after motion begins to increase, it is then followed by relaxed alertness and thereafter reaches the point of alert attention. At this juncture, it is important to mention, that a higher level of activation is concurrent to an even better and more efficient processing of information. This conclusion is relevant because it makes the correct usage of communication policy possible so that advertising strategies can then be specifically tailored and customized in order to stimulate consumer cogni­zance to a maximum. Generally speaking however, it must be remembered that a high level of activation could without warning, suddenly switch to an over activation which would have an adverse effect, one contrary to the objectives of communication policy. In this likely scenario, the performance of an individual would decrease depending on the level of increase of activation, (as illustrated in the above graph), which would therefore result in strong arousal. These conditions could as a result culminate in maxi­mal activation, expressed in the form of panic, which then makes it virtually impossible for an individual to perform in a rational way. In contrast involvement is considered to be a special form of activation. Therefore, it can be defined as processes encompassing the accumulation and absorbing of infor­mation, following which involvement is thereafter exclusively focused on the re­searched object. Involvement describes to what degree a stimuli becomes personally relevant to the consumer and to the extent that short-term activation took place, this being based on the amount of stimuli experienced during the process of evaluating, ab­sorbing, collating and storing the information. Due to this fact, involvement can be considered to be an additional incentive for the intake of information, presuming that in this scenario, this process has been triggered. Essentially at this point, it must be re­membered that there are different forms of involvement. The two most fundamental forms for the purpose of this thesis, are the affective and the cognitive. Regarding to affective involvement, the customer is prepared to risk experiencing high emotional levels of energy which is reflected in a display of either positive or negative feelings towards the proposed product or service. This though prevents the customer from thor­oughly examining and absorbing the information, due to the fact that these emotions overrule his rationality. Therefore, affective involvement can be equated with decided­ly low levels of involvement. Cognitive involvement, on the other hand, means that the consumer thinks carefully about his objectives. This, in contrast to affective involve­ment, is represented by high involvement since the customer consciously and painstak­ingly takes time to consider an offer or service, which, among other things, is generally reflected in the learning processes of the consumer. As aforementioned the basis of affective and cognitive information processing was acti­vation and involvement. Close scrutiny reveals that affective information processing, involves three significant factors. The first vital factor is emotion. Emotions can be defined as the subjectively perceived and interpreted condition of stimulation within the body, in combination with cognitive perception. It must be remembered, that emotional experiences can only evolve through cognitive processing. Moreover, emotions are guided by impelling forces, meaning that the intensity of stimulation, the tendency of either pleasant or unpleasant feelings, as well as the quality of subjective experiences are often paired with different traits such as love, joy, sadness and many other diverse feelings. Emotions would therefore motivate a person to say that they are feeling pleasure or displeasure regarding to something, someone a situation etc.. Interestingly enough, according to the psy­chologist Mr. Carroll E. Izard, there are ten different emotions which can be defined as primary emotions and which are congenital. These include interest, astonishment, joy, disregard, shame, sorrow, anger, disgust, anxiety and guilt. According to Mr. Izard, all other emotions consist of a mixture based on these ten primary emotions. At this point, it is relevant to mention the link between emotions and marketing. It is the aim and objective of marketing strategies to trigger the positive and pleasurable feelings of a customer. With this in mind effective marketing schemes can be implemented by making use of such things as pictures, colours, music, fragrances or even simply a well- thought-out selection of words and lyrics. These activities can rapidly trigger the con- sumers’ feelings and animate him to action. Nonetheless, the consumer retains the freedom to choose to be either coaxed into giving in to emotions aroused by a particular marketing strategy, or be inclined to resist and repress them. Notwithstanding the option chosen by the consumer in the end, when used successfully, they still allow a company to strengthen its emotional bond with its customers, even if it is only through the use of the power of suggestion. When additionally incorporating unique selling propositions to their marketing strate­gies, companies are better placed to create a unique experience for the customer. By virtue of this subtle approach a product or service will become more firmly etched in the consumers memory, thereby enabling them to identify with the product or service being offered, while at the same time mentally distancing themselves from comparable prod­ucts or services offered by competitors. Emotions alone, however, are insufficient in order to persuade a consumer to buy a product. Motives also play a vital role and can be defined as perceived deficiencies, while at the same time having the urge to eliminate these. In other words, motives embody other forms of emotions which are driven to act in accordance with cognition, which in turn controls behaviour. This is expressed when a person wants to do or achieve something. It can therefore be said that motives act as guidelines for human beings. At this point, it is worth mentioning, that motives are almost always driven by strong impulses. In this context there are two driving forces, which need to be given particular attention: primary and secondary. Primary forces include motives of the natural kind, such as sexuality, hunger and thirst, which are also the most basic physio­logical needs according to Maslow’s pyramid. In contrast, secondary forces are mo­tives which have been learned at some given point. Factors such as success, diversifica­tion, prestige etc. are sometimes the root cause of the development of such tendencies. Besides these driving forces, there are four other motives, that need to be taken into consideration. This applies to intrinsic and extrinsic motives, as well as to conscious and subconscious motives. Intrinsic motives imply that the consumer rewards himself, by personally undertaking a certain course of action pleasing to him, by acting in a certain way. For example, this can be expressed by him seeking new stimuli, such as striving to learn new things, which in turn acts as a strong motive for him as pleasure is derived from this activity. These motives might even overrule his primary impulses. Extrinsic motives on the other hand, means that the consumer behaves in a way that is observable and unexpected and as a consequence is rewarded by the environment. For example, a person wants to have a job promotion and willingly invests an enormous amount of time and energy to this end. The manager observes his efforts and decides to give him a better job. Conscious or extrinsic motives are observable and can readily be used to the companies’ ad­vantage, whereas subconscious or intrinsic motives and their impact on the customer cannot accurately be determined. Nevertheless, as in the case of emotions, companies can systematically adjust their marketing strategies appropriately by striving to arouse certain motives in their consumers, making them believe that they have specific needs that only their company are in a position to satisfy. In summation, this means that mo­tivation combines the stimulation of emotions as well as the cognitive effects of behav­iour control. The ultimate important influencing factor is attitude. Attitude can be defined as per­ceived subjective suitability of an object to satisfy given needs. In concrete terms this means that an object is judged based on the experiences or opinions which have already been formulated arising from cognition. This appraisal is arrived at by examining and comparing the advantages and disadvantages of different products or services. This can include not only taking a closer look at the products and services being offered, but also, for example, reviewing advertisements pertinent to the said offer. After a comparison has taken place, the consumer is then in a position to make a deci­sión as to his preferences. There is even a thesis about how much impact attitude has on the conduct of a person, which can be verified by the so-called E-V- hypothesis. 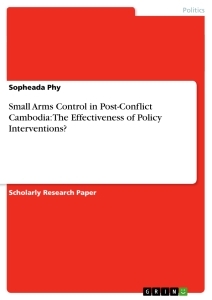 This hypothesis implies, that the attitudes of today have an impact on the behaviour of to­morrow, and also points out the importance of considering framework conditions de­pendent on each respective situation. Preferences are therefore based on the attitude of the consumer, which is based on and influenced by the cognition of a person, meaning, what the person has learned and expe- lienees that they have made. Before moving on to the next point, it must be said that this hypothesis has been critically called into question by various literary sources. The whole process of affective information processing can be summed up as follows: - initially a person needs to be activated or aroused. Activation, when cognitively inter­preted, leads to emotions, which is nothing less than an arousal of the central nervous system. Emotion in combination with target orientation leads to motivation, which then in turn leads to attitude, following the evaluation of an object. Keeping this process in mind provides companies with the ability to successfully influence the consumer’s thinking and thereby their behaviour, by means of communication policy, as described in chapter two. Cognitive information processing is characterized by information intake, information processing and information storage. In other words, cognitive information processing is nothing more than learning and the storing of data, which is closely related to neuro- marketing. In order to fully understand the workings of this process, it is vital to acknowledge and accept the timeless fact, that the processing of information by humans has proven to be the most inviolable means of learning from times immemorial. So important is this ability, that it has ensured the survival of the human race over un­told centuries. Furthermore, this skill enables humans to react to external factors in specific ways. How though can learning be defined? Some define it as a process, which has outlasting effects on the potential of behaviour, as a consequence of experiences that have been made. In summing up, it is safe to say, that practically all human beings are born with the disposition and capacity to learn throughout their entire lives. Nevertheless, given that humans are capable of learning in general does not mean that everyone possesses the identical level of understanding or attains equal standing when it comes to acquiring learning skills. Much depends not only on the ability to compre­hend on the part of each person, but also the extent to which the individual is curious or willing enough to learn new things. An extensive amount of knowledge and elements of learning occur subconsciously. This fact is important in the development of com­munication policy strategies, since advertisements and other tools for example can be effectively implemented to trigger the subconscious learning process. The positive effects of this strategy can be exponential by means of repetition. Chapter 3.2. will take a more detailed look at why repetition is essential and how it affects the information that the brain assimilates and processes. How is information processed, after the brain has become familiarized with it? Pro­cessing can take place through perception, thought and decision making. Applying this definition to product evaluation results in the deliberate categorizing and assessing of the information pertaining to it. This enables the consumer to evaluate the advantages and usefulness of the product. What though does the process of memorizing or storage include and how does this process function? In order to answer this question, it is essen­tial to remember, that according to Atkinson and Shiffrin (1968) there are three different procedures, used by the brain when processing information. These are the sensory in- formation memory, the short-term memory and the long-term memory. Initially, a certain stimulus, or information reaches the brain and is the first encounter with the sensory memory. Within this memory, also known as ultra-short-term memory, the brain selects specific data from its reservoir of information and thereafter retains these impressions for a short period of time. Almost simultaneously, the information is converted into bioelectrical impulses and is then further processed through interpreta­tion and linkage of the information or stimuli. The capacity of sensory memory is limit­less, but short-lived, because the information is never stored for more than one second. Since this process occurs automatically, this element of information processing takes place affectively. From this point on the retained information is adopted by the short­term memory, also known as the working memory. The short-term memory thereafter tries decoding these sensory impressions, while consequently accessing the long-term memory for the purpose of establishing a link between the newly-found information and previously stored knowledge. The available capacity of the short-term memory is con­sidered to be somewhat limited. As a consequence, only a figure of approximately twen­ty information units are able to be processed within a period of five seconds. If the voi- ume of incoming data happens to be quite high, the brain either decides to transfer the information into the long-term memory or to delete it. This form of processing takes place consciously, or in other words, cognitively. The long-term memory retains a broad spectrum of knowledge and experiences an individu­al has accumulated or made throughout his lifetime. When it comes to preservation of information, the brain’s capacity for storage and retention is unlimited. According to the so-called interference-theory, once the information is saved and stored in this long­term memory it is never deleted. Therefore, when an individual happens not to remem­ber something this is not caused by simple forgetfulness, but rather by a lack of accessi­bility often triggered off by superimpositions, or so-called interferences. Under ideal circumstances though, the long-term memory not only serves to absorb information, but it can also ensure that such data is easily accessed time and again by the short-term memory. Depending on the nature of infoimation which has been retrieved, a person accordingly reacts to it. This is generally termed output. Moreover, new information which is stored in the long-term memory is then interfaced with infoimation already memorized. This is referred to as semantic network. It is of general interest to note that so-called cognitive dissonances can and do arise, from time to time. Cognitive dissonances can be classified as conflict of interests. When these dissonances emerge, they more often than not lead to the discomfort of the con- sumer. They mostly start to materialize after a product or service has been purchased or used and are frequently the result of wrong decision-making brought about by an incorrect way of thinking about a product or service. The fact that a wrong decision has been made only becomes apparent after purchase, when it is found that a product or service is not of the desired standard or quality anticipated by the consumer or the fact that other alternatives would have proven to have been an even better choice. Incor­rectly made decisions or choices are more often than not influenced by a variety of ap- preaches. One such approach is the use of selective perception. This means that customers tend to focus exclusively on information relevant to their point of view, concentrating on certain details and aspects, while ignoring the sum total of the information presented. For example, it was found that people buying cars frequently pay more than the usual attention to advertisements corresponding to the make or brand of vehicle currently in their possession, rather than advertisements of other well-known brands owned by their competitors. In so doing, they fail to keep an open mind by ignoring the likely ad­vantages that competitive products or services could entail. Another possibility to re­duce cognitive dissonances, is to alter information by calling into question the trustwor­thiness of a source, or by implying that a competitor is driven by ulterior motives and not acting in the best interest of the consumer. Cognitive dissonances that surface after a purchase has been made can also be exploited by means of well thought-out and de­signed advertisements. By the use of this form of communication policy, cognitive dis­sonances after a purchase can also be artificially generated by intimating to the custom­er that a competitor’s product is not as good as it implies to be. This can be driven by campaigns such as the exchange of old products of the competitor against new ones of the company’s own brand, or conversely, to reassure the customer that he has decided on the right product. Such campaigns are underscored by sending out personalized emails, special offers etc.. Given the possibility that customers could, in one way or another become distracted or side-tracked from buying a product, the next chapter will show, why repetition is so essential and how the learning curve is involved. The learning curve chart depicts the results of learning processes. The starting point for the graph is the learning process, which is sustained by repeatedly using the same learn­ing material. Source: According to Meffert, H., Marketing basics, 1998, p. 762. Basically, there are two different phases involved in memorizing, as seen in the graph above. These are the learning phase and the forgetting phase. S-shaped curves are typ­ical for learning curves and combine both phases. The learning curve displays the con­tent that should be internalized within a certain time period. The efficiency of the learn­ing curve is dependent on the knowledge a consumer has acquired over time, as well as his level of intelligence and chosen learning techniques. The forgetting curve displays how much a human should have learned, what has actually been memorized over a cer­tain period of time and how much has been forgotten. In this context, an analysis was carried out in order to ascertain how repetition influ- enees the memory, especially with regard to information already stored for an extended amount of time. As a result, it was found that repetition actually helps to improve the quantity of information committed to memory. Concerning how the learning and forgetting phases are differentiated, there are essen­tially two methods usually implemented. One measurement tool is the recall- procedure. This procedure uses the communication policy, for example, advertisements etc., which are shown to a test person. After having seen it, the person has to, firstly try to remember the advertisement and secondly, to reveal exactly what he was able to commit to memory. This tactic can be employed with or without helping aids such as slogans, magazines, music, brand names etc.. The method utilizing helping aids is known as the “aided-recall-procedure” and the one without the use of such aids, as “un­aided-recall-procedure”. There even exists a so-called “day-after-recall” test, whereby different test persons are interviewed 24 hours after an advertisement has been dis­played. While the recall-procedure is based on memory, another possibility is the so- called recognition-procedure, which is based on recognition. With regard to this proce­dure, the test person is confronted with a pool of information and the task is then to as­certain and recognise what he has learned at that time. For the pulpose of control, in­formation is then added to the pool, without the knowledge of the test person. A com­parison of both the recall and recognition-procedures has constructively shown that the recognition-procedure is too vague. In contrast, however, the unaided recall-procedure is capable of providing the most realistic figures when an evaluation is needed to ascer­tain how effective and feasible a certain advertising strategy will be or has been. The efficiency of this method is dependent on the time frame involved, beginning with the initial contact that the consumer has with an advertisement, and thereafter the time in­volved in surveying his opinions and attitude toward the product or service. This corre­sponds to the aforementioned diagram of the learning and forgetting curve. Nevertheless, it must be said that several recall-tests have proven that even this method is not quite reliable either, since other influencing factors, such as past experience, atti­tude towards a product or service etc. are often excluded. Consequently, the following chapter will take a closer look at different types of consumer buying behaviours, as well as at the influential factors potentially involved. Throughout the years, there have been different approaches employed to attempt to ex­plain consumer buying behaviour. In order to be able to comprehend this subject though, it is of utmost importance to know, why research on such behaviour is neces­sary. This can only be fully understood after taking into account the objectives of con­sumer behavioural researches. Simply put, correct knowledge of the purchasing and decision-making processes of a consumer, provides an important indicator with regard to understanding the degree of influence that applied marketing strategies actually have. Moreover, environmental factors must also be examined to ascertain the extent of their impact. In general, there is a distinction to be made between total and partial models when trying to explain the purchasing decision-making process. Nevertheless, there are two important scientific approaches that make it possible to examine and un­derstand the effects of such strategies and procedures. The aforementioned approaches are especially to be found within the form of black-box models, also known as stimulus- response models and in stimulus-organism-response models. Black-box models prove to be somewhat restrictive when it comes to analysing the ex­ogenous stimuli or input, as well as the consequential output, which concurs with the results of the consumers’ buying decision. This behaviouristic approach only takes ob­servable variables, stimulus and responses into account when attempting to explain the resulting impact of these variables. The main target of this model is to identify the relationship between physical stimuli and behavioural patterns. Interestingly enough, scientists have discovered that there are different behavioural patterns within black-box models. For instance, it was found that while one consumer felt driven by this stimulus to buy a product, another consum­er, although exposed to the same stimuli, did not choose to purchase the product. Subsequently, therefore, scientists came to the conclusion that these emerging differ- enees could not solely be attributed to the stimulus that triggers a consumer to make a purchase or not. As a result of this innovative insight, a different approach was cho­sen. The behaviouristic approach was replaced by cognitivism. This ground-breaking approach comprised the theory that mental information processing was not dependent on a certain stimulus, quite the contrary, these processes took place autonomously. As aforementioned, this model is somewhat limited, being only able to take observable variables, the stimuli serving as input and the output serving as reaction, into account. This is why it is called “black-box,” since it is not in a position to measure or explain the internal processes involved in cause and effect, and therefore excludes internal pro­cesses. Therefore, based on the behaviouristic approach, the so-called neo- behaviouristic approach was created which is illustrated in the stimulus-organism- response-model (S-O-R model). The concept of the S-O-R model is as follows: stimuli can be triggered by influential factors such as environmental experience, media environment or the marketing mix - meaning price, place, product and promotion. The organism, on the one hand contains the activating processes which essentially consist of emotions, motives, attitude etc., as well as cognitive processes, which for example incorporate information intake, learning, etc.. The output leads to a response, which can be expressed by the quantity of a product bought, the choice of a certain product or brand, etc.. In summation it can be said that the S-O-R model, in comparison with the black-box model, additionally attempts to explain exactly those processes within the black-box of a consumer, which applies to interceding variables. At this point, it is also extremely important to mention the lim- bic system. This is defined as an accumulation of different structures within the brain and which play an important role in supporting such functions as long-term memory, controlling emotions, motivation and in particular, a variety of other impelling forces. In conclusion, it can therefore be said that the limbic system additionally has a huge impact on the purchasing behaviour of a consumer. The next chapter will take a closer look at the different types of buying behaviours. Extensive buying behaviour means that the decision-making process primarily takes place cognitively. The consumer invests a lot of time actively searching for detailed information about a product, as well as comparing it with similar products together with their market prices before arriving at a conclusion, and therefore an informed decision. This kind of buying behaviour especially takes place, when a consumer is intent on buy­ing high-end products. This course of action especially applies when purchasing fairly expensive and exclusive products, by means of which the consumer is in a position to uniquely distinguish himself from other people. A typical example of this is the pur­chase of a car. In general, it is safe to say that extensive buying behaviour takes place only occasionally. Contrasted to extensive buying behaviour, it is altogether evident that the process of limited buying is somewhat more prevalent among the buying public. In this instance, the consumer possesses a basic knowledge of a product or semce, which may also en­compass a limited number of buying alternatives. As soon as it is imagined that one of these alternatives complies with his perceived ideas and needs, the consumer arrives at a decision and chooses this alternative, which action immediately results in an inteiTup- tion of the cognitive process of searching, analysing and decision making. Processes driven by emotions or motives rarely matter when it comes to this kind of buying behaviour. Often the decision-making process is influenced by the thought of obtaining something low priced, advantageous terms of payment, a special offer etc.. As a consequence, therefore, the limited buying behaviour pattern presents the greatest risk for the emergence of dissonances, which more often than not arise after the product or semce has been acquired. In order to avoid these dissonances and their accompanying discomfort, it is imperative that the consumer accumulates sufficient information before deciding to purchase or acquire a certain product or service. Habitual buying behaviour, on the other hand, pertains primarily to products that do not differ too much from another with regard to ingredients or content, but all existing un­der a multitude of diverse brand names. This applies to staple foods such as sugar, eggs, milk etc.. These products would not normally be the subject of close scrutiny by the consumer. For this reason it can be said that if a consumer repeatedly chooses the same brand, this is solely due to the reality that he has gotten into the habit of buying the same product and not because he somehow feels a deep attachment to the brand in one way or another. This is verified by the fact that the consumer, when going to a supermarket puts the same products into his basket in the same sequence as always, and most times with a keen sense of leaving the store as quickly as possible. Therefore, when analysed, it can be said that habitual buying behaviour occurs automatically and that it is not linked to any kind of cognitive or emotional processes. Variety seeking buying behaviour occurs when the consumer decides on trying out on new brands or different makes. He may decide on this because he is generally curious about trying out new things, or because he is longing for diversification. Interestingly, the consumer invests little or no effort and time in examining the products he decides to buy, although he may be fully aware of the fact that products differ a lot from one an­other. This kind of behaviour is strongly triggered by the media environment, as well as the experience a consumer has gathered in his lifetime. Contrary to all aforementioned buying behaviours, the impulsive buying behaviour is synonymously linked to emotions. In this instance there is no chain of events that actu­ally takes place before a decision is made, which is why this kind of buying behaviour almost always involves on the spot decisions. In this buying behaviour scenario, the product serves as the stimulus. Due to the fact that a reaction follows shortly after the consumer has been triggered, the ability to be rational proves to be virtually impossiЫе. The specific buying behaviour eventually employed is very much dependent on the situation, the personality of the consumer, as well as the type of product or semce being offered. Based on the extent to which one or more of these influential factors is manifested, a particular buying behaviour is then exhibited. Relevant to these fea­tures, that have a decisive impact on the buying behaviour of consumers, what other factors need to be considered? The next chapter will provide the answer to this question. Besides the aforementioned influencing factors, such as activation, cognition, motiva­tion, attitude, emotions etc., there are several other important aspects which need to be taken into account. These include the needs and basic necessities of a customer, product value, product availability, alternatives as well as environmental parameters. This part of chapter four will examine these key factors in more detail. Most people wrongly conclude that need and necessity mean the same. However, closer scrutiny reveals that these terms differ distinctly from one another in significance and motivation. How then can they be differentiated? A necessity can be defined as an urge or understood to be a striving to eliminate a feeling of existing deficiencies. This, for example, applies to basic necessities such as hunger or thirst. Furthermore, the consum­er is not often aware of what exactly causes these real or imagined deficiencies. Once the necessity has been substantiated, it evolves into a need. Needs are defined as desires and are powerfully linked to purchasing power. In other words, the customer longs to acquire, possess, use or consume a product or service. Achieving this target, satisfies his need. This could for example, apply to a consumer who already possesses a TV, but due to new technologies which have been created, such as Blu-ray disc, HDMI (High Definition Multimedia Interface) internet access etc., he longs to acquire a new one. This scenario can be categorized as a need. When a need leads to a purchase, a de­mand is created, which is why purchasing power is to be viewed as a prerequisite for satisfying such needs. The process of substantiated necessity and needs which leads to demand, culminates in advantages and benefits from the acquired service or product for the consumer. This asset is defined as the degree of expected or actual satisfaction of said needs. Therefore, dependent on the expectations cherished by the consumer, the benefit is either very high and therefore more than satisfactory, or very low and unsatis- factory. In summation and with regard to the above-mentioned points, it can be said that necessi­ty and needs have a huge impact on the consumer’s buying behaviour since these factors more often than not, lead to a purchase being made. It is important to remember though, that this can only take place when the consumer is able to identify what is considered necessary in order to eliminate any existing deficiencies. Likewise, the value that a product or service contains also has an impact on the buying behaviour of a consumer. In general, the term “product” is understood to incorporate all benefits and terms and conditions etc. that a company is able to offer to their customers. This includes basic benefits as well as intangible services. The value of a product is as­certained as a result of how important and prized a consumer perceives a product or service to be. This perception takes place by means of the processing of information and is interpreted through different stimuli and internal signals. To be more precise, the sen­sory organs play a huge role in the assimilation of information enabling created impres­sions which have been gathered about a product or service, to be interpreted and cogni­tively processed. The process of perception is to be viewed as absolutely subjective, due to the fact that every human has a different way of perceiving and processing in­formation. As a consequence, product value is also a subjective variable because every human be­ing creates his own world of perception, which is why, for example, a specific make of car, is of greater significance to one person than it is for someone else. This fact makes it highly improbable that all human beings are ever likely to attribute the same significance to a given product or service. For some it is valuable due to its material worth, for others, it might just have a more profound meaning based on other criteria. Therefore, it can conclusively be said that product evaluation is directly linked to per­ception and that evaluation can also be viewed as subjective processes which are pri- mařily defined by subjective characteristics. During the process of evaluation, the knowledge gained about the product is analysed and rated with the objective of develop­ing an indicator with regard to the quality of the offered product or service. From this it becomes clearly evident that the outcome of such processes will also likely be viewed as a subjective evaluation of the product. Due to the many different ap- preaches available with the objective of encouraging a consumer to view a product as valuable, it is important for companies to be sure of exactly what products and services they want to offer and which specific target groups they want to focus on. It is also vital for them to find the optimal balance between the actual price of a product, since the aim is to reduce costs while at the same time attaining the best possible financial rewards. Moreover, it is important that the company keeps in mind the need to offer value for money to the customer, and to take into consideration what a consumer would willingly pay for such products or services. Nevertheless, the aforementioned points make it clear, that it is impossible to inspire every person from a specific target group to want to buy or acquire a product or service due to their subjective attitudes towards these fac­tors. Product availability and product alternatives are two factors heavily interdependent with each other and both of which also play a major role in determining the buyer’s behav­iour. For a consumer it is reassuring and desirable for him to be certain that a product is always available when needed. As a consequence, the decision to purchase a product can confidently be made without worry and it does not become necessary for the consumer to deviate from his original buying intention. With this in mind, companies must at all times strive to ensure that their products are available since this logically increases the prospect of their products being readily bought. Nevertheless, it sometimes occurs that a consumer has followed up on information about a certain product, decides to buy it on certain conditions, but it turns out that the company was unable to deliver the desired product because it was not readily available at that time. Consequently, the consumer is forced to adapt to this new situation. As a result, he either decides to change his initial purchase by looking for al­ternatives. Another scenario is that consumers are often convinced that they want to acquire exactly the product they have set their minds on, but when confronted with a selection of products, they decide on a totally different one. This can be prompted by arousal of certain stimuli that surface while searching for the desired product, things such as special offers, advertisements, product tests etc.. Therefore, it might well prove advantageous to always feature alternative goods even when the consumer has already set his sights on a totally different product. Of course, every consumer has his preferences, but alternatives are almost always considered ow­ing to the lack of choice of products or services, out of sheer curiosity, or because of new stimuli which has been triggered off. Interestingly, preferences can be defined as a balancing of attitudes with regard to at least two different alternatives, which are indi­vidually evaluated. However, preference is wide-ranging in its meaning and therefore subject to amendment. Bearing the foregoing in mind, companies are in a position to take advantage of this information since they are able, on the one hand to ensure that their specific products are available at all times and at best, that they differ in character from other products. Consequently, the consumer feels strongly compelled to purchase their products. Moreover, companies can also try to gain new consumers by steering them away from their trusted brands and exciting them with alternate products and services that they themselves can offer. Environmental parameters also have a huge impact on the buying behaviour of the cus­tomer. These parameters can be defined as inclusion of all market participants, whose influence is derived from external sources and set limits and restrictive frameworks within which one is allowed to manoeuvre. Therefore, they can be classified into dif­ferent groups of environmental parameters, also known as “PEST-analysis” (Political, Economical, Social, Technological). This analysis controls all external effects, which surpresses external influences. Moreover, it serves as an aid in analysing the market and equips a company with an excellent opportunity to be in a position to consider a range of different tactics, pertaining to development within constantly changing markets. The individual factors include a variety of subject matters. Economical parameters influence the development of the national income, as well as the national level of development, etc., basically everything that influences the economic situation of a country. Socio-demographic parameters pertain to such topics as size of families, social attitudes, demographic structure etc.. Technological and ecological pa­rameters incorporate new technologies, climate changes, mineral deposits and other factors. Political and legal parameters include export regulations, customs, food regula­tions and standards, competition laws etc.. Environmental parameters can also exist in the form of influence exerted by family, friends, culture and social class. Depending on the extent of regulations and the influence of environmental parameters, a person’s buying behaviour is either limited or immeasurable. Source: According to Burmann, c., Kirchgeorg, M., Meffert, H., Marketing, 2015, p.
The brand’s history commenced in 1826, when Philippe Suchard decided to start pro­ducing chocolate in Switzerland. At that time, it was called “Suchard Schokolade.” The sensation about this chocolate was, that Mr. Suchard had the brilliant idea of combining dark chocolate with milk, turning it into tender whole milk chocolate. Therefore, later in 1901, the brand was renamed in Milka indicating and combining the abbreviation of milk and cocoa in German. Interestingly, the brand had already received its typical distinctive lilac coloured packaging, which is well known in many different countries. Over a course of many years the brand developed and became increasingly popular. Consequently, in 1913, the manufacturers produced eighteen times more chocolate compared to production in 1880. Throughout the years the brand’s appearance changed, as well as the design of the logo. Nevertheless, it was not until the 1960’s, that the de­sign and brand name Milka were registered as official trademarks and that despite the fact that the lilac colour had already been a well-known characteristic of the company for a great number of years. Additionally, it was also not until 1965 that it was adopted as the official colour of the company and as a consequence, distinguished the distinctive identity of the brand. At that time, the mascot of Milka, the now famous lilac coloured cow, had not yet been created. This actually took place in 1972 and as a result, conse- quently rocketed the brand to new heights of acclaimed recognition. Up until 1990 Milka had belonged to the Kraft Food group, but after the group was split in October 2012 Milka then became part of the Mondelez group, who were manufactur­ers of a variety of snacks and sweet treats. The reason for this decision was the belief, that separating the company would allow each part to flourish and grow. This belief, in actual fact, proved to be true. Today, the Mondelez group combines a number of many different brands, which makes it somewhat remarkable. At present Milka stands out in the group as one of the largest and also strongest brands that they own, being available in over 40 countries worldwide and selling approximately an astonishing number of 150.000 diverse Milka products every hour. The most recent successful and lucrative development of the company, took place when Milka additionally began selling their products in China in 2016. Another proof of Miika’s fame and success particularly in Germany, is that according to one survey, Milka has proven to be the most popular brand of chocolate in that country for the past four years, in comparison with other brands. As already mentioned, Milka had for a great number of years been using the now fa­mous typical lilac colour for packaging without any noticeable changes throughout a long period. The brand’s colour, as well its lilac cow, were supposed to remind the cus­tomer of the Alpine heritage of the chocolate which it embodied. It can be said, that the decision to utilise this design definitely attracted the attention of consumers. Moreover, Milka efficiently and effectively, without ceasing, used novel advertising methods and actively seized all opportunities that presented themselves to act as spon­sor. This being one reason why this brand can be cited as a notable example of pro­gressive advertising, back then in the 20th century and even now in the 21st century. Cp. Fritz, W; v.d. Oelsnitz, D., Marketing basics, 2006, p. 21. Cp. Geyer, o., Runki, p.M., Thewißen, c., Wahl, F., Marketing basics, 2015, p. 4. Cp. Bliemel, F., Keller, KL., Kotier, p., Marketing management, 2007, pp. 12. Cp. Burmáim, c., Kirchgeorg, M., Meffert, Marketing, 2015, pp. 361. Cp. Broda, s., Marketing mix, 2005, p. 25. Cp. Geyer, o., Runia, PM., Thewißen, c., Wahl, F., Marketing basics, 2015, p. 157. Cp. Pepels, w., Marketing, 2004, p. 350. Cp. Kleinhiickelskoten, H-D., Marketing mix, 2000, p. 33. Cp. Kleinhiickelskoten, H-D., Marketing mix, 2000, p. 32. Cp. Fetchenhauer, D., Psychology, 2012, p. 5. Cp. Atkinson, R.C., Atkinson, R.L., Bem, D.J., Nolen-Hoeksema, s., Smith, E.E., Introduction psycholo­gy, 2001, p. 4. Cp. Atkinson, R.C., Atkinson, R.L., Bem, D.J., Nolen-Hoeksema, s., Smith, E.E., Introduction psycholo­gy, 2001, p. 6. Cp. Witt, H., Introspection, 2010, p. 491-492. Cp. Eckardt, G., Core problems psychology, 2010, p. 21-142. Cp. Kroeber-Riel, w., Weinberg, p., Consumer behaviour, 2003, p. 79. Cp. Foschi, T., Schramm-Klein, H., Swoboda, ?., Buyer behaviour, 2017, p. 38-39. Cp. Trommsdorff, V., Consumer behaviour, 2009, p. 41-42. Cp. Rennhak, c., Promotion, 2001, p. 15. Cp. Trommsdorff, V., Consumer behaviour, 2009, p. 42. Cp. Mäßen, A., Advertising impact process, 1997, p. 35. Cp. Apel, H., News, 2018, p. 64. Cp. Schweiger, w., Use of media, 2007, p. 200. Cp. Gmppel-Klein, A., Kroeber-Riel, w., Consumer Behaviour, 2013, p. 55. Cp. Gmppel-Klein, A., Kroeber-Riel, w., Consumer Behaviour, 2013, p. 56. Cp. Northoff, G., Pathophysiology, 2002, p. 133-134. Cp. Trommsdorff, V., Consumer behaviour, 2009, p. 59. Cp. Foschi, T., Schramm-Klein, H., Swoboda, ?., Buyer behaviour, 2017, p. 48. Cp. Feiser, G., Advertising psychology, 2015, pp. 341. Cp. Esch, F-R., Kroeber-Riel, w., Advertisements, 2015, n.p..
 Cp. 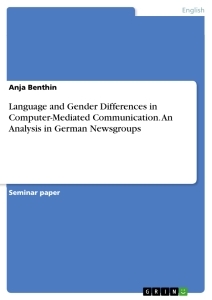 Fuchs, w., Management Communication, 2003, p. 63; Mangold, M., Schmitt H.B., Customer expe­rience, 2004, p. 116. Cp. Schneider, D.J.G., Technological marketing, 2002, p. 107-108. Cp. Foschi, T., Schramm-Klein, H., Swoboda, ?., Buyer behaviour, 2017, p. 55. Cp. Gröppel-Klein, A., Kroeber-Riel, w., Consumer Behaviour, 2013, p. 56. Cp. Droge, R., Buying behaviour, 1997, p. 91-92. Cp. 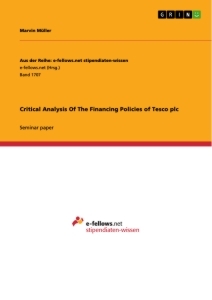 Kesper, B., Müller-Schoppen, E., Management, 2011, p. 20. Cp. Conrad, p., Staehle, W.H., Sydow, J., Management, 1998, p. 165. Cp. Burmáim, c., Kirchgeorg, M., Meffert, H., Marketing, 2015, pp. 113. Cp. ?? ?-Enders, B., Marketing and ethics, 1996, p. 32. Cp. Hall, C.S., Lindzey, G., Thompson, R.F., Psychology, 1978, p. 324. Cp. Bidmon, s., Customer Satisfaction, 2004, p. 18. Cp. Möll, T., Brand emotions, 2007, p. 42-43. Cp. Helmig, ?., Tscheulin, D.K., Specific marketing, 2001, p. 356. Cp. Trommsdorff, V., Consumer behaviour, 2009, p. 143-144. Cp. Strohner, H., Cognitive Systems, 1995, p. 7. Cp. Wither, G., Learning with joy, 2016, p. 42. Cp. Gold, A., Hasselhorn, M., Pedagogical psychology, 2017, n.p..
 Cp. Booth, s., Marton, F., Learning and understanding, 2014, p. 13. Cp. Gold, A., Hasselhom, M., Pedagogical psychology, 2017, n.p..
 Cp. Gernsheimer, o., Raab, G., Schindler, M., Neuromarketing, 2009, p. 231. Cp. Scholz, M., Product Recommendations, 2009, pp. 103. Cp. Steiner, p., Specific advertisement, 2014, p. 90. Cp. Leven, w., Gazing behaviour, 1991, p. 22. Cp. Steiner, p., Sound Branding, 2018, p. 31. Cp. Steiner, p., Sound Branding, 2018, pp. 31. Cp. Geyer, o., Runia, p.M., Tliewißen, C., Wahl, F., Marketing basics, 2015, p. 31. Cp. Geyer, o., Runia, p.?., Thewißen, c., Wahl, F., Marketing basics, 2015, p. 31. Cp. Engelkamp, J., Rummer, R., Long-Term-Memory, 2006, p. 308. Cp. Kessler, H., Psychology, 2015, nlp..
 Cp. Gaßner, w., Organizational changes, 1999, p. 19. Cp. Hofballer, G., Körner, R., Nikolaus, u., Poost, A., Innovation, 2009, p. 156. Cp. Hofbauer, G., Körner, R., Nikolaus, ?., Poost, A., Innovation, 2009, p. 156. Cp. Mark, A.M., Social acting, 2009, pp. 52. Cp. Armstrong, G., Kotler, l , Saunders, J., Wong, V., Marketing Basics, 2011, p. 292. Cp. Armstrong, G., Kotler, p., Saunders, J., Wong, V., Marketing Basics, 2011, pp. 110. Cp. Pflaum, D., Communication policy, 2007, p. 199. Cp. Herbier, w., Psychology, 1986, p. 96. Cp. Foschi, T., Schramm-Klein, H., Swoboda, ?., Buyer behaviour, 2017, p. 118. Cp. patzel, ?., Learning curve, 2017, p. 105. Cp. Berekoven, L, Eckert, w., Ellenrieder, p., Market research, 2001, p. 182. Cp. Hüttner, M., Schwarting, u., Basics market research, 2002, p. 412. Cp. Bruhn, M., Brand communication, 2012, p. 524. Cp. Raab, G., Unger, A., Unger, F., Methods marketing research, 2018, pp. 364. Cp. Huber, A., Marketing, 2016, p. 124-125. Cp. Fréter, H., Customer orientation, 2008, p. 64. Cp. Lorenz, L, Emotional branding, 2008, p. 34-35. Cp. Kühling, C., Musiol, G., Customer loyalty, 2009, p. 31. Cp. Loren7 Emotional branding, 2008, p. 35. Cp. Kühling, c., Musiol, G., Customer loyalty, 2009, p. 32. Cp. Loren¿ L, Emotional branding, 2008, p. 35. Cp. Bähr, M., Frotscher, M., Neurology, 2003, p. 312. Cp. Upledger, J.E., Human brain, 1996, p. 140. Cp. Häusel, H-G., Think limbic, 2014, p. 209. Cp. Wiltinger, A., Comparing advertisement, 2002, p. 86; Geyer, o., Runia, p.M., Thewißen, c., Wahl, F., Marketing basics, 2015, p. 38-39. Cp. Wiltinger, A., Comparing advertisement, 2002, p. 86. Cp. Geyer, o., Runia, p.M., '?Thewißen, c., Wahl, F. , Marketing basics, 2015, p. 39. Cp. Geyer, ?., Rimia, ?. ?., Thewißen, c., Wahl, F., Marketing basics, 2015, p. 39. Cp. Geyer, o., Runia, p.M., Thewißen, c., Wahl, F., Marketing basics, 2015, p. 39. Cp. Geyer, o., Runia, p.M., ?Thewißen, c., Wahl, F., Marketing basics, 2015, p. 39. Cp. Wikinger, A., Comparing advertisement, 2002, p. 86. Cp. Wikinger, A., Comparing advertisement, 2002, p. 86-87. Cp. Freiling, J., Reckenfelderbäumer, M., Market and companies, 2004, p. 85. Cp. Kleinaltenkamp, M., Kuß, A., Introduction to marketing, 2013, p. 69. Cp. Freiling, Reckenfelderbäumer, M., Market and companies, 2004, p. 85-86. Cp. Diehl, s., Product experience, 2009, p. 11-12. Cp. Franken, s., Behaviour, 2007, p. 36. Cp. Kiinzel, FI., Brand perception, 2012, pp. 215. Cp. Diehl, s., Product experience, 2009, pj 11-12. Cp. Engeln, w., Product development, 2006, pp. 2. Cp. Hegenbart, T., Consumer behaviour, 2009, p. 34. Cp. Heim, R., Steiner, M., Preferences, 2008, p. 27. Cp. Pifko, c., Environmental parameters, 2011, p. 36. Cp. Fuchs, G., Paxmann, SA., Business plan, 2010, p. 82. Cp. https://www.badische-zeitung.de/wirtschaft-3/10errachs-herz-ist-milka-lila-die-geschichte-des- schokowerks-74432823.html, Accessed 17.05.2018. Cp. https://www.mondelezinternational.eom/~/media/MondelezCorporate/Uploads/downloads/milka_Fact_Sh eet.pdf, Accessed 17.05.2018. Cp. https://de.statista.com/statistik/daten/studie/182300/umfrage/konsum-tafelschokoladenmarken-im- letzten-monat/, Accessed 17.07.2018.